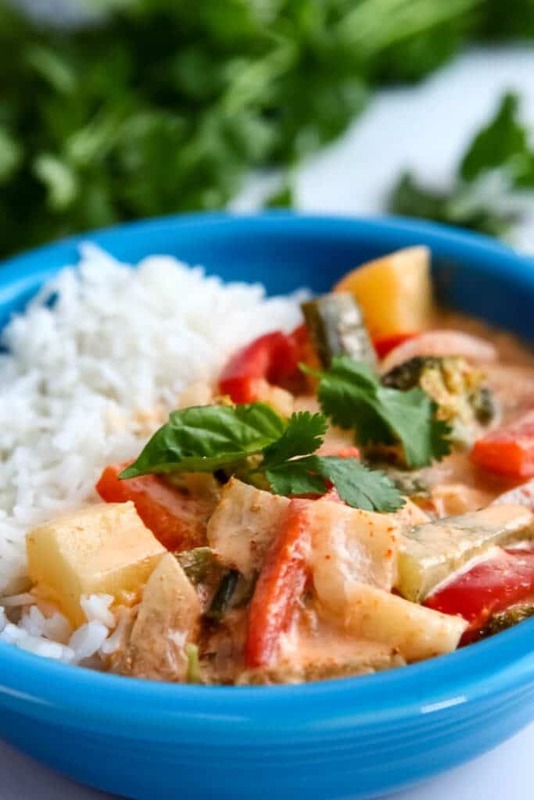 This Red Thai Curry with Vegetables will make you feel like you are at your favorite authentic Thai restaurant right in your own kitchen! It’s packed with veggies, coconut milk, and perfectly blended herbs and spices. Best of all it’s made in 1 pot in less than 30 minutes! It’s hard to believe that something that tastes so good can be so quick and easy to make! simply delicious and tastes like authentic Thai red curry! – This is seriously one of my all-time favorite meals! vegan, gluten free, soy free, and nut free so nearly everyone can enjoy it. great for dinner parties – Just keep a pot of the curry sauce warm and let your guests serve it over their choice of rice or rice noodles! a flexible meal that tastes great with a variety of vegetables and you can adjust the spice level to suit your taste. Vegetables – Onions, bell peppers, broccoli, cauliflower, zucchini, cucumber, mushrooms, green beans, sweet potato, and kale are all great choices. You just need about 3 cups of whatever veggies that you choose. Oil – any neutral flavor oil to lightly fry the vegetables. 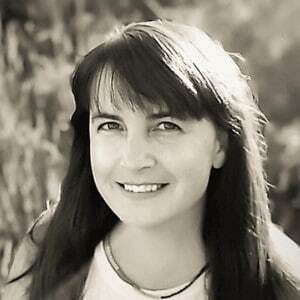 Coconut Milk – A can of full-fat coconut milk works best. You can use light coconut milk, however, it won’t be as rich and creamy. (You can also use coconut cream for a very rich sauce). Water – to make the sauce more liquidy and account for some evaporation while it simmers. Red Curry Paste – You can find Thai brand red curry paste in most grocery stores. I find that it is not as spicy and flavorful as I would like, so I use Maesri red curry paste that I find at my local Asian market or order from Amazon. (If you use the Thai brand curry paste, you may need more than 2 tbsp to get it flavorful enough). Pineapple – Either fresh or canned. An optional, yet delicious addition to the spicy, savory curry sauce. The sweetness of the pineapple just balances out the flavors. You can also use cooked butternut squash or sweet potatoes to add sweetness to this dish. Ginger – (Optional)about 1/4 inch of the ginger root freshly ground with a microplane. Fresh Herbs – Cilantro and fresh basil add color and a burst of fresh flavor to this dish and is highly recommended. Lime – for squeezing in a little juice – adds acidity to balance out the sweetness. (optional). Protein – (Optional) If you want to make this a more filling meal, you can add crispy fried tofu or even a vegan “chicken” to the sauce. Rice or Rice Noodles – to serve the vegetable red curry sauce over top of. White rice, brown rice, rice noodles, bean thread noodles, or sweet potato noodles all work well. 1 pot – to cook the veggies and make the sauce. Spoon – to stir the sauce and serve it over rice or noodles. Microplane – for grating ginger if you choose to add it. 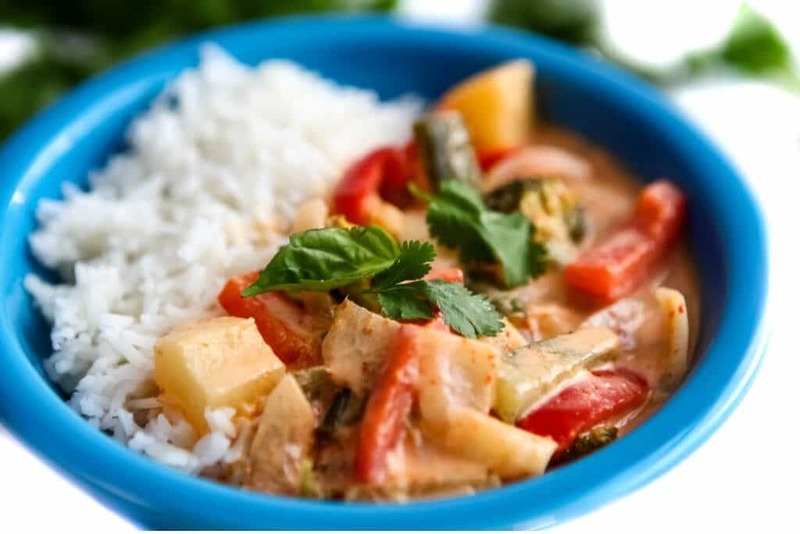 How do I make Red Thai Curry with Vegetables? Cook your choice of rice or noodles according to package directions. Saute sliced onions in a little oil until slightly translucent. Add cut vegetables of choice, sprinkle with salt, and continue to saute them for about 3 minutes. Pour in a can of coconut milk and the red curry paste. Add the pineapple cubes (Or cooked squash or sweet potato). (optional to add sweetness). Add crispy fried tofu or other protein of choice if desired. Stir well and simmer on low for about 10 minutes. Add a squeeze of lime juice or some rice wine vinegar for a little acidity. Top with fresh basil and/or cilantro and serve over rice or noodles. Note: if you choose not to add pineapple or another sweet vegetable like butternut squash or sweet potato, then add 1 tbsp of brown sugar to the sauce for added sweetness. 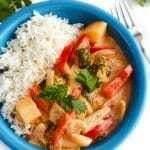 Can I make Red Thai Curry in a crockpot? Yes, red curry sauce is a great dish to make in a crockpot. It can slow cook all day, allowing the spices to absorb through the sauce. It’s perfect for those days when everyone is eating at different times, or you don’t know when you will have time for dinner. Your red curry sauce can just be warm and waiting to serve. 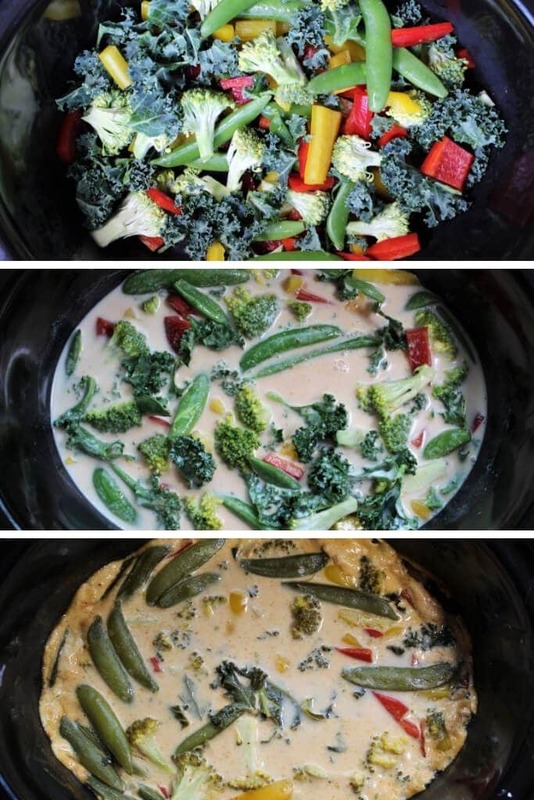 Add the veggies of choice, a can of coconut milk, water (plus an additional 1/2 cup water), red curry paste, salt, and pineapple (optional) to your crockpot. Stir well, cover, and turn to low for about 3 hours. Add fresh cilantro and/or Thai basil and a squeeze of lime and turn to warm until you are ready to serve over rice or rice noodles. Note – It works great for potlucks and parties too! Just keep extra Thai red curry sauce ready for anyone who likes it spicy. Serve on warm in the crockpot and have some rice ready to serve it over top of. 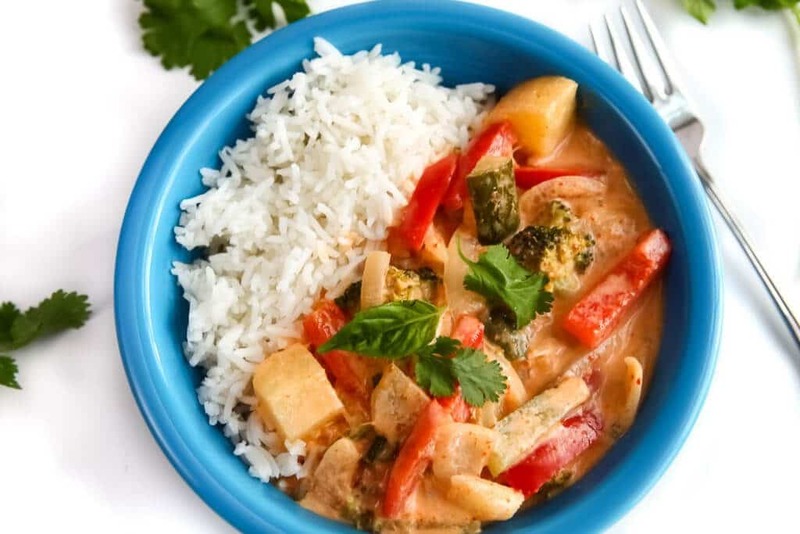 Can I use red curry for meal prep? 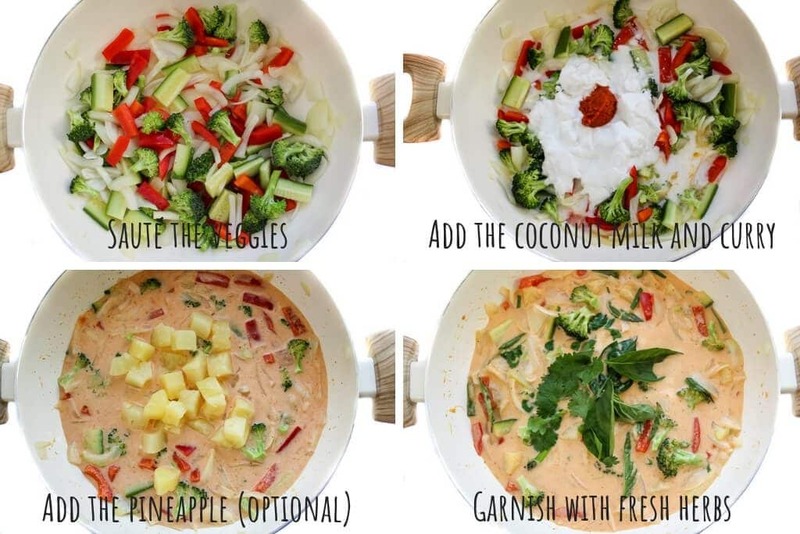 Yes, this Thai red curry works great for meal prep! The flavors just get better the next day, so you can make it ahead of time for sure! You can put it in small containers and eat it for lunches for 3-5 days or freeze it until you are ready to reheat it. Does red Thai curry freeze well? Yes, it tastes just as good after it has been frozen and reheated as it did when you first made it. It’s an ideal dish for meal prepping or make ahead meals. (If you choose to add tofu to your dish, the texture of the tofu will change a little after freezing). If you love easy coconut curry meals as much as I do, you have to try my Thai Coconut Rice with Green Curry and Veggies! You will also love my easy Easy Vegan Tom Yum and Tom Kai Thai Soup recipes! Follow me on Instagram for daily vegan inspiration and clickable links to all of my recipes. A red curry sauce made with coconut milk to be served over rice or noodles. 1 1/2 cups fried tofu (optional) or vegan "chicken" strips or other protein of choice. Add cut vegetables of choice and continue to saute them for about 3 minutes and sprinkle them with salt. Pour in a can of coconut milk, the red curry paste, and water. (or pineapple juice). If you choose not to add pineapple or another sweet vegetable like butternut squash or sweet potato, then add 1 tbsp of brown sugar to the sauce for added sweetness. If you are making this in a crockpot, use an additional 1/2 cup of water to account for the moisture that will evaporate. If you are using canned pineapple, save the juice that it's packed in and add it to the curry sauce instead of the water. To make mild curry sauce use 1 tbsp or even less if you don't like spicy food. To make a spicy curry sauce add up to 3 tbsp of red curry paste to the sauce. I love Thai food but I never make it since it seams hard. This was SO easy and yummy! I’m so happy that you gave it a try! It is amazingly easy to make!